There are some people who are so heartbroken by the loss of a loved one that they go to a medium (i.e., the devil), in order to hear the voice of the departed person, to talk to them, to find some kind of relief. Do they really hear the voice of the dead? Victor H. Ernest, the former medium, gave a blunt answer. The voice they heard isn’t that of their loved one but of a devil. And the poor unfortunate people are left with the illusion that they’re in contact with the soul of the person who passed away! A) Reading other people’s thoughts: According to Victor H. Ernest, this happens when a person’s intelligence is working hand in glove with an evil spirit, or when the whole person is actually under the control of an evil spirit. B) Seeing something that’s happening far away in a dream or in a trance: Two people at the séance attended by Victor H. Ernest were able to read the headlines of morning newspapers while they were still being run off at the printer’s, hours before they were delivered to the town. Some, who are even more “advanced”, can see into your house as if with a camera and can find hidden objects, etc. No matter how impressive are the “wonders” performed by the agents of Satan (mediums, magicians, etc. ), they can’t stand up to the power of the presence of the Cross. They disperse. They burst just as if they were soap bubbles. As indeed they are. Possessed people (when the fit is upon them) become unrecognizable: the face becomes distorted, the head twists, the mouth gapes. The tongue is thrust out and the victim howls. It is truly a horrible sight. In this state, a possessed person is capable of revealing all your “achievements” (i.e., sins). It is not just general and vague, either, but specific and in detail. Without knowing you, they can tell you for example, your name, where you were and what you were doing the previous evening, and who you were with. (It’s worth noting that if you’ve confessed to a priest, the possessed are unable to do this). - How do they manage to know your secrets? - Why is it that sins confessed aren’t able to be seen? During their fit, however, they show other symptoms. - At the Divine Liturgy they feel as if they’re burning (although when they see fire they don’t). - Before the Honorable Cross, they feel as if they’re being cut to ribbons (although when they see a butcher’s knife they don’t). - When a priest makes the sign of the Cross over them with the “spear” used in the Divine Liturgy by the priest to cut the Communion Bread, they feel as if their flesh is being pierced. One priest did this and the possessed person howled: “Why are you sticking that spear into my flesh. Why are you pulling at the spear and tearing my flesh?” (Yet the same person was able to bear the touch of a sharp knife without howling). - When they look upon holy relics, they feel as if they themselves are on fire. 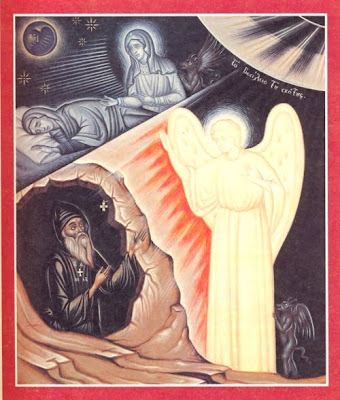 - Why should the possessed fear the Divine Liturgy yet not fear, for example, heart surgery? - Why do they fear the Honorable Cross, which, after all, is only two bits of wood, yet don’t fear a sharp butcher’s knife? - Why is it that they feel they’re being cut open when the sign of the Cross is made over them? - Why do they fear the relics of saints such as St Gerasimos, a poverty-stricken little monk who was full of love, yet don’t fear the remains of bloodthirsty Lenin, who slaughtered millions of his fellow-citizens? All the above show us that there’s something about the possessed person that is very badly disturbed by the Honorable Cross, the Divine Liturgy, and the relics of our saints. And this “something” is the same thing that can reveal your secret sins, unless you’ve confessed them. For us Christians, this “something” is the devil. What about unbelievers? Do they just put it down to parapsychology and be done with it? There are of course those scientists who declare that all of this will one day be explained by the goddess of “science”. They’re sure of this. Yet this may not be the case, since it’s still in the future, so why are they so sure? What sort of logic is that? But never mind. If in the future science demonstrates that this something really is the devil, will they then believe it? The father whose son was possessed said to Christ: “Every time the devil bothers him, it throws him down, foam comes from his mouth and he gnashes his teeth and becomes catatonic" (Mark 9:18). Some know-it-alls explain this by saying the boy was epileptic. But so was Julius Caesar, who lived before Christ. People in the ancient world were familiar with the difference between epilepsy and possession. They weren’t as “backward” as we like to think. Another possessed man never stayed at home, but went wandering around the deserts and graveyards. Summer and winter he walked around stark naked (Luke 8:27-39). Another threw himself into the fire to be burnt and yet another into the water to drown (Matthew 17:16). The two possessed men of the Gaderenes were “exceedingly fierce”. They were so wild and aggressive that no one could approach them. They were the bane of people’s lives (Matthew 8:28). If a criminal is arrested by the police and is handcuffed, then no matter how strong he is, he can’t break his bonds. His hands are tied, as it were. This isn’t true of people possessed. If they’re handcuffed, for example, even if they’re paralyzed, they’re capable of breaking open handcuffs. St Luke tells us in the Gospel that the Gadarene man who was possessed “was kept bound in chains and fetters, and he broke the bonds.” He was completely immobolized, but despite that he broke the chains! - Bring up a hurricane to destroy houses and uproot trees. - Whip up a storm that would sink all the shipping in the area. - Drown men and beasts. - Make an earthquake that would level towns and cities. But he refrains from this. Why? Wouldn’t he like to turn everything upside down? Certainly he would, if he could. He’s prevented from doing so by God. If God didn’t keep the mania of the demons in check, we’d see them playing with the world like a ball. How Does He Fight Us? - Is what you have in mind perhaps seed sown by the devil? Is it perhaps misleading you towards seemingly good thoughts? - Is, perhaps, your philosophy of life and death (which you think is correct), really a set of thoughts from the devil? 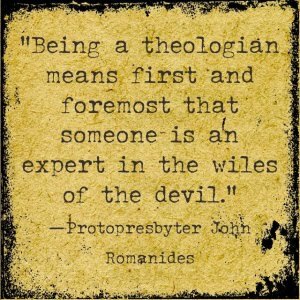 - Are even your thoughts on spiritual matters, as an Orthodox Christian, perhaps really thoughts of the devil? Perhaps. One thing you can be sure of: the devil hasn’t made an exception of YOU.